Nothing was ever wasted in a good homestead. Offals, which are so under appreciated today, were always used as everyday food, or in delicacies. Certain offal dishes—such as foie gras, pâté and sweetbread—are still considered gourmet food in international cuisine. Being loaded with vitamins A,B and D, riboflavin, foliate, thiamine, niacin as well as essential amino acids, grass fed offals deserve to come back to our diet. All offals do not store very well, especially liver. If you get liver with your meat order from a local farm, please, do not leave it in a freezer for weeks. The best way is to prepare it all immediately. If it is a whole beef liver, you can save few pieces for quick stir fry and pâté the rest. Whole beef liver makes a lot of pâté, which is good. Prepared, it could be divided to smaller portions, vacuum packed and frozen for quite a while. Cut liver in big pieces, removing as much of connective tissue as possible. Put it in a deep skillet together with lard or bacon, cut in 2-3 pieces onion and carrot, add spices and salt, poor water just enough to cover the liver and simmer over a low heat until the liver is tender (for about an hour). Strain the liquid out and set it aside to cool. Remove bay leaves and cloves and grind the rest in a meat grinder. Set it aside to cool. Meanwhile beat the butter so it is light and fluffy ( it should be at a warm room temperature). When the liver paste is cool enough not to melt the butter, stir it in. Now you have to adjust the consistency. To do it, add as much of the saved and cooled down liquid as you feel is needed to make the pâté smooth and spreadable. If you’ve made a lot, set aside some for immediate use and vacuum pack and freeze the rest. When you thaw the pâté, freshen it up with few drops of freshly squeezed lemon juice and white wine to make it more gourmet. 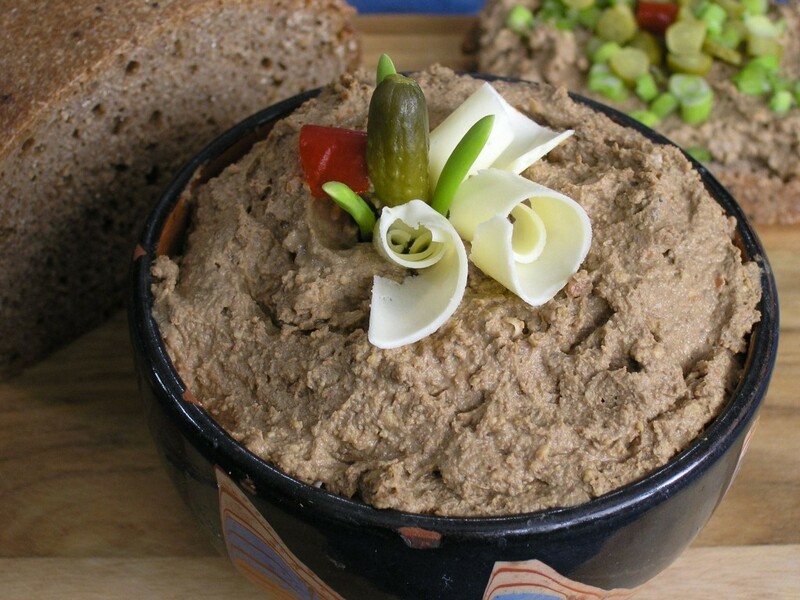 There is no need to say that pâté spread goes excellent on a slice of homemade bread with your homemade pickles, fresh greens and with, or without, a glass of wine!